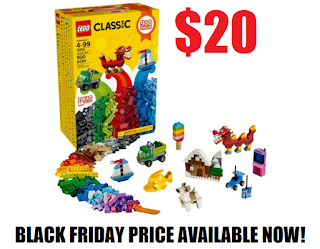 LEGO 900 Piece Creative Box $20 + Free Pickup at Walmart or Free Shipping With $35 Order - BLACK FRIDAY PRICE AVAILABLE AGAIN! LEGO 900 Piece Creative Box $20 + Free Pickup at Walmart or Free Shipping With $35 Order. This was their Black Friday Price and available now again. Grab it while you can it's an awesome deal!